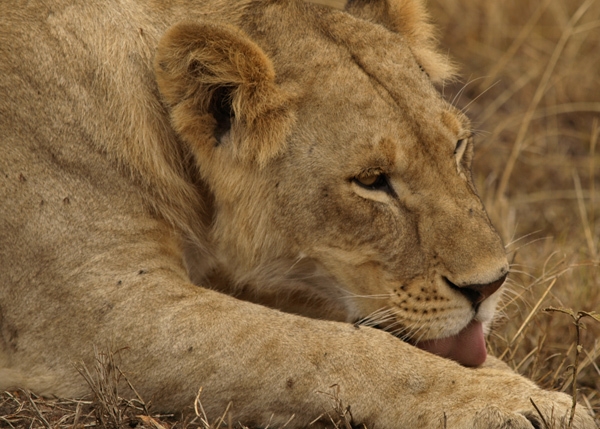 Kenya’s lion population has decreased to less than 2,000 individuals, and could become regionally extinct within 20 years (Africa Geographic Magazine, August 2011). The EWCL Lion group is partnering with Ewaso Lions to enhance ongoing research and promote the conservation of lions in the Ewaso Nyiro ecosystem of northern Kenya. An innovative citizenscience program called “Lion Watch” is currently being developed through this partnership. A key component of “Lion Watch” is to train local wildlife guides to accurately identify and monitor all of the lions in the region using state‐of‐the‐art technology. Existing data on lions in the region and data collected in the field by the “Lion Watch” guides will be uploaded to a website (www.lionwatch.org). The website will help Ewaso Lions monitor the health of the lion population in the region and engage tourists and locals in lion research and conservation activities. The EWCL Lion group partnered with Ewaso Lions to develop “Lion Watch”, a strategy to train and utilize local wildlife guides to help monitor lions throughout the Ewaso Nyiro ecosystem. 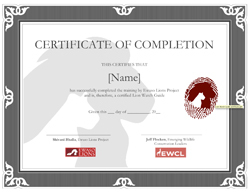 Over the past year, EWCL raised $6,300 for the project. The bulk of these funds were used to purchase 10 handheld multifunctional devices (e.g. GPS, camera, data entry) equipped with a two year subscription to the Wild Knowledge WildKey application, a customized lion identification and data collection application. The Lion Watch Guides will use these mobile devices to collect data on lions and upload this information to the project’s website. Additional training materials developed and/or purchased include Lion Watch pins, certificates, and lion reference guide books. EWCL also partnered with a web developer, Lucky Star Websites, which donated their expertise and time to develop the project website, www.lionwatch.org. This website will provide regular updates of local lions in the project area and allow visitors to get involved in lion conservation. Through this strategy, we hope to make Lion Watch a self‐sustaining project. To promote the Lion Watch project and website, posters were developed to be placed at the airport and Lodges in the area. 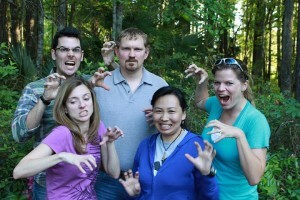 The Lion Watch Guide training was originally scheduled for April 2012, but it was postponed due to flooding in the region. Ewaso Lions plans to reschedule this training as soon as conditions improve and time allows. Lion Watch guides will learn about local wildlife, how to use the mobile devices, and how to identify local lions by sight. 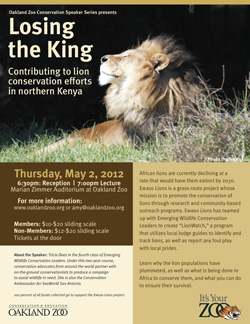 EWCL member, Tricia Dees, was featured as part of the Oakland Zoo’s Conservation Speaker Series. Tricia’s presentation was open to the public and promoted via the Oakland Zoo’s website. Wild Knowledge, the developer of a mobile application for Lion Watch Guides, maintains a short summary of Lion Watch on their website. Want to help with this project? 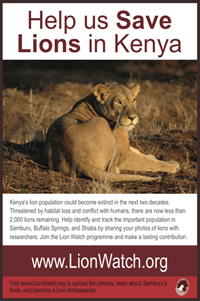 Visit www.lionwatch.org to become a lion ambassador, upload your lion pictures from the region, or donate to Ewaso Lions.